Socorro, New Mexico – New Mexico Institute of Mining and Technology performed very well in a recent ranking of Physics degree programs. College Factual ranks programs offered by four-year colleges and universities and has recently updated its rankings. New Mexico Institute of Mining and Technology’s Physics program was ranked #39 out of 263 schools nationwide. This puts the school’s program in the Top 15% of all Physics programs in the United States. New Mexico Tech improved its position 29 slots over the previous year’s ranking of 68. See the full ranking by Physics major. New Mexico Tech’s Physics program has been ranked #1 in New Mexico. This makes the Physics program at the school the best in the state. New Mexico Tech has achieved this ranking 2 years in a row. See the full ranking of Physics programs in New Mexico. Based upon PayScale survey data*, a student who graduates from New Mexico Tech with a degree in Physics will make average early-career earnings of $51,109 and average mid-career earnings of $94,385. This is above the national average of all graduates, who make $50,774 in their early career. It is also above the average graduate’s mid-career salary of $90,603. Learn more about outcomes at New Mexico Institute of Mining and Technology. New Mexico Institute of Mining and Technology is located in Socorro, New Mexico in what is generally considered a small town atmosphere serving approximately 1,600 undergraduate students. Learn more about New Mexico Tech. College Factual, located in Troy, New York, is a leading source of college data analytics and insights, with a strong focus on student outcomes. Its mission is to help all types of students discover their best-fit college and major so they can enjoy their college experience and graduate with less debt. 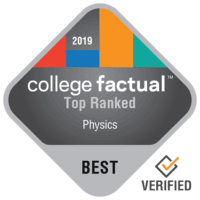 College Factual provides coverage for over 2,500 colleges and universities, 350 college majors, for students in over 160 countries. Learn more about College Factual. Get notified when similar news about New Mexico Institute of Mining and Technology happens.